After reading your post about vinegar and bicarbonate of soda as cleaners, I've been using bicarb more to clean and deodorize things (a bicarb and water paste is pretty good for spills on fabrics and carpets - just massage it in then leave it overnight and vacuum it up the next day. Clogs the vacuum filter something fierce, though). In the course of my experiments, I've found that if you add bicarb to near-boiling water, it fizzes. This is with plain water fresh out of the electric kettle, not water plus vinegar or anything else acidic. Add bicarb to the water, it fizzes and dissolves. Add more bicarb, more fizz. Add more hot WATER to the existing bicarb-and-water solution, and it fizzes again! What's going on, here? I know dissolving stuff in water can change the boiling point, but I think it usually INCREASES it, and the difference isn't usually very large. Is the bicarb providing nucleation sites for boiling? Why's it still happen when the bicarb's dissolved, though? And how can it boil water that's not hot enough to boil naturally any more? The Wikipedia article actually explains this; above 70 °C, sodium bicarbonate and various other bicarbonates decompose. In sodium bicarbonate's case, it goes from NaHCO3 to sodium carbonate (Na2CO3), water and carbon dioxide. The hotter it is, the faster this happens, and it happens in solution too. So the fizz is still carbon dioxide bubbles, just as if you'd added bicarb to vinegar, but the source of the CO2 bubbles is different. In one of Alastair Reynolds' books, someone sets off a "pinhead-sized" antimatter bomb, and it explodes with a yield of about two kilotons of TNT. Is that accurate? Would you really only need that much? I think you're talking about Revelation Space , the first book in that series, written slightly before Futurama debuted and so forgivable for its inclusion of a captain named Brannigan. First, note that in a matter-antimatter explosion, you're not just converting the mass of the antimatter into energy. You're also converting an equal mass of matter, because if that matter was not around there'd be no annihilation and no explosion. The energy yield of matter annihilation is a simple case of mass-energy equivalence, and thus subject to the famous e equals mc squared. Which is to say, energy in joules equals the mass being annihilated in kilograms times the square of the speed of light in metres per second. The dominant number there is obviously c-squared; the speed of light in vacuum is 299,792,458m/s, and squaring that gives you 89,875,517,873,681,800. Or, in less-cumbersome scientific notation about 8.99E+16 - 8.99 times ten to the power of 16. "TNT equivalent" bomb-yield numbers are tightly defined, too; one ton of TNT is defined as 4.184 gigajoules. Now, what's a pinhead weigh? I just grabbed some ordinary one-inch dressmakers' pins and found there were about fifteen whole pins to the gram. I'm not about to snip off enough pinheads to get them to add up to the minimum resolution of my triple-beam balance, but I'd guess the mass of these pins' heads to be ten milligrams, at most. Fortunately, the mass of the Revelation Space bomb is mentioned in the book; it's described as containing "only a twentieth of a gramme of antilithium". That's fifty milligrams, but that doesn't sound like a crazy weight for the head of a stouter pin than the ones I weighed. ...which at 4.184 gigajoules per ton of TNT, adds up to 1.074 kilotons. Double that to take into account the matter that's annihilating with the antimatter, and you get 2.148 kilotons. Which is indeed close enough to two kilotons for horseshoes, hand grenades and tactical nuclear weapons. = 2.33 kilograms of matter converted into energy, for the biggest bomb we've ever made, and possibly the biggest bomb we ever will make. Around the weight of a healthy adult chihuahua. why do some things glow brightly in colours OTHER THAN BLUE when illuminated by a blue LED flashlight? Is it fluorescence? But doesn't that only happen under ultraviolet light? Does this mean my blue LED flashlight has UV output? it's incredibly bright, but is it actually even brighter and more dangerous than it looks? First up: I highly recommend coloured LED flashlights. They let you do this! The above animation accurately reproduces what it was like for me selecting the images to use to illustrate this post, except I was doing it fullscreen on a 30-inch monitor, and so almost neutralised my neurons. In the olden days, the only coloured portable lights normal humans could afford used an incandescent bulb, with a coloured filter over it. This was incredibly inefficient, and usually didn't even give you one tightly-defined wavelength of light. Your green-filtered flashlight probably still emitted some red and blue. Today, you can get high-intensity coloured LEDs with a very tight band of output frequencies; no blue in your green, no green in your red. I think the best-value options are the coloured variants of the Ultrafire 501B lights. I reviewed a white 501B years ago here, but this line of lights still sells well today, because they're basically just SureFire knockoffs with standardised lamps and battery compartments. 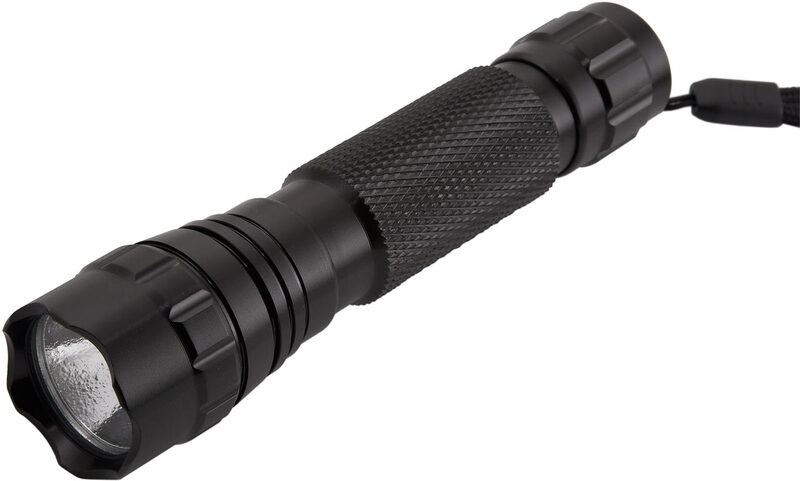 So you can today buy a white 501B that's quite a bit brighter than the one I reviewed, or upgrade your old 501B with a newer interchangeable lamp, or stick a cheap coloured Ultrafire lamp in your old SureFire incandescent flashlight, et cetera. As long as you stick with a single 18650 lithium rechargeable or two rechargeable or non-rechargeable 123-size cells. Any cheap LED module that's meant to fit in a a flashlight like this should work. 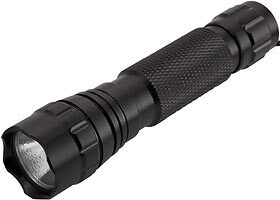 Here's an eBay search that finds a bunch of coloured Ultrafire flashlights and lamps. The lamps start at $US9.99 delivered, but a whole flashlight (without batteries) is under $US15 delivered. A red, a green and a blue Ultrafire 501B, plus three 18650s and a charger from eBay will only cost you about $US50 all told. The cheapest dealers all have free shipping, too, so you can buy the lights one at a time and not lose any money. I'd really get all of them, though, and I don't even go to raves. It's just so much fun chucking large amounts of coloured light around. And yes, you do get a pretty decent white-ish light if you shine them all at the same thing. So. Where was I? Oh yes, fluorescence. Fluorescence happens when a substance absorbs some kind of radiation, usually light, and then emits light of its own. It happens when the incoming energy, usually a photon, "excites" an electron to a higher quantum state. When the electron then "relaxes" back to its ground state, it loses some energy to heat and emits the rest as a new photon. Since the energy and frequency of a photon are directly related, and the outgoing photon is less energetic than the incoming one was, one-photon fluorescence like this only works "downward" in the ROYGBIV spectrum. You'll only see visible-light fluorescence when you're illuminating a fluorescent object with light closer to the blue end of the spectrum than the colour the object fluoresces. Ultraviolet light is beyond the blue end of the visible spectrum, so it can cause fluorescence in any visible colour. But there's no rule that says the incoming light can't be visible; it just has to be further up the spectrum than the colour of fluorescence it creates. 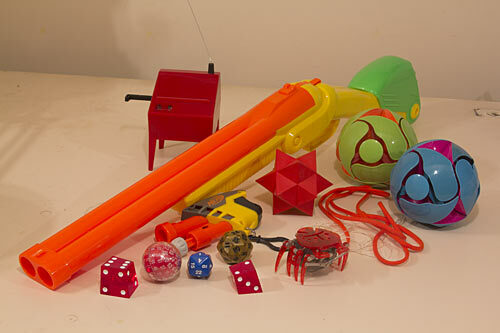 So here are some brightly-coloured objects from around my house, illuminated by tungsten-filament bulbs. Some of the dyes used to colour many modern polymers are highly fluorescent; shining an ultraviolet light around your house is the best way to find them, but a blue LED flashlight will do a good job too. A red flashlight's no use, though. It's probably possible for red light to cause visible fluorescence that's even deeper into the red, but you'd probably need a spectrometer to distinguish it from simple reflection of the illuminating light. Here, we see what basic colour theory says we should. 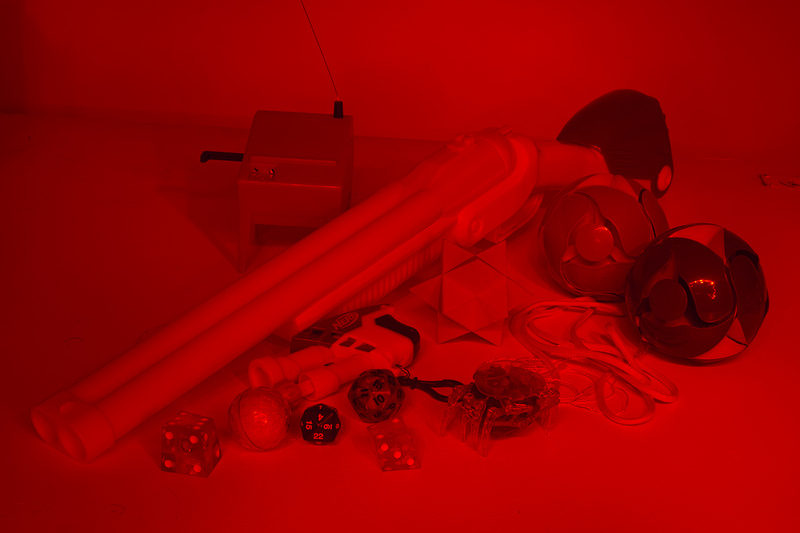 All we're seeing is the red light that bounces off the scene, so everything is shades of red, and the less red there is in the colour of an object, the less of the incoming light will bounce off it and the closer to black it will look. Go to green light, though - not even blue! - and suddenly fluorescence is happening. The red Gakken mini theremin (as hard to play as a full-sized theremin, but with the mellow, soothing tone of a Stylophone! Buy one today! ), and the red rubber Escher's solid (sold as a dog chew toy, of all things, at my local discount shop), and the red crooked dice, are behaving as basic colour theory says they should. There's no green in them, so they look black. The orange parts of the Nerf guns, though, are cheerfully fluorescing under the bright green light. 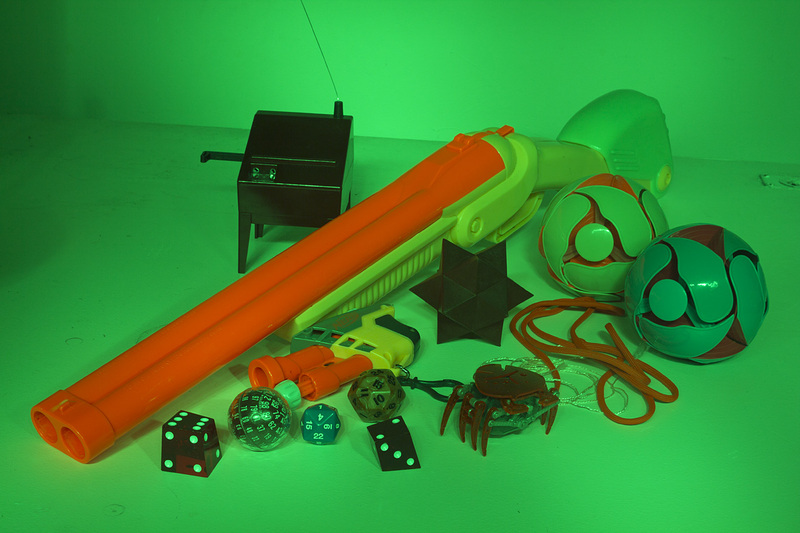 I think the yellow parts of the toy guns may be fluorescing a bit under green as well. They mainly look yellow only in comparison with the fluorescing orange plastic (as per this amazing optical illusion), and my digital camera certainly isn't a calibrated colourimeter, but there's still a significant amount of red in there with the bouncing green. That adds up to at least a yellow-ish green. The length of red paracord (useful for all sorts of things, and also the only flexible string I've found that Joey's little razor teeth don't go straight through) and the carapace of the crab Hexbug , aren't as fluorescent as the plastic, but they're having a go. Oh, and check out the two Hoberman Switch Pitch balls. One is green and orange and is fluorescing a little and reflecting rather more in the green light; the other is blue and magenta, and is hardly fluorescing at all. OK, on to the blue light that started this interminable thing. 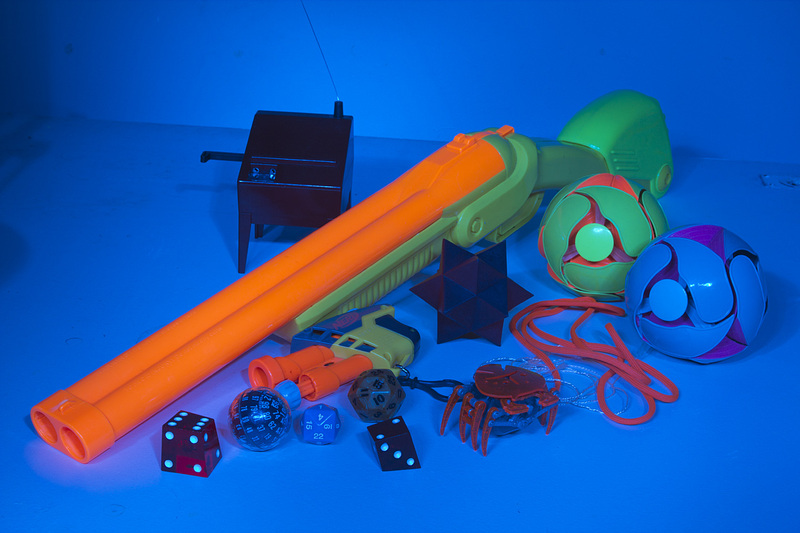 Now the lower-fluorescers from the green-lit shot are fluorescing with more enthusiasm, the things that never fluoresced in the green are still sticking to pre-quantum-physics colour theory, and the orange plastic has gone nuts. There's a pretty sizeable energy gap between LED-blue and that orange, so it's sucking up and spitting out electrons photons with great enthusiasm. My own store of quantum energy ran out before I made an actual UV-lit version of the picture, but I could pretty much just Photoshop one up in less time. All of the fluorescing things in the blue-lit image would look much the same under UV, and everything else would be invisible. Or, more realistically, you'd see everything else in faint blue, because the ultraviolet compact-fluorescent lamps I've got here emit a fair bit of visible blue-violet light along with the UV. You can get UV LEDs that emit proper near-UV light (not the more dangerous UV-B or even more dangerous "germicidal" UV-C) with very little visible output. Most "UV" LED flashlights use cheaper purple LEDs, though, which may have a bit of near-UV output but basically just do what a blue LED light does, only more so. And yes, you can get UV Ultrafires, too, but I don't know which flavour of "UV" LED they contain. How come NASA spacecraft need all that heat shielding, but SpaceShipOne and Two don't? Does this have something to do with escape velocity - they don't go that fast, so they fall back down when the engines stop and don't have to re-enter. But they do get outside the atmosphere, right? Is there more than one kind of re-entry? There's no clear line where "the atmosphere" stops. By convention, the Kármán line at an altitude of 100 kilometres is treated as the end of the atmosphere; SpaceShipOne made it to 112 kilometres, and SpaceShipTwo is intended to do the same, but with more people on board. But satellites in low orbit well above the hundred-kilometre line need periodic re-boosting to compensate for the drag of the tenuous outer reaches of the atmosphere. Take the International Space Station, for instance; it orbits from 330 to 410 kilometres up, but still needs periodic re-boosting to prevent its orbit decaying. This goes for anything else delivered or serviced by the Space Shuttle, too; inability to reach high orbit was one of the Shuttle's numerous shortcomings. 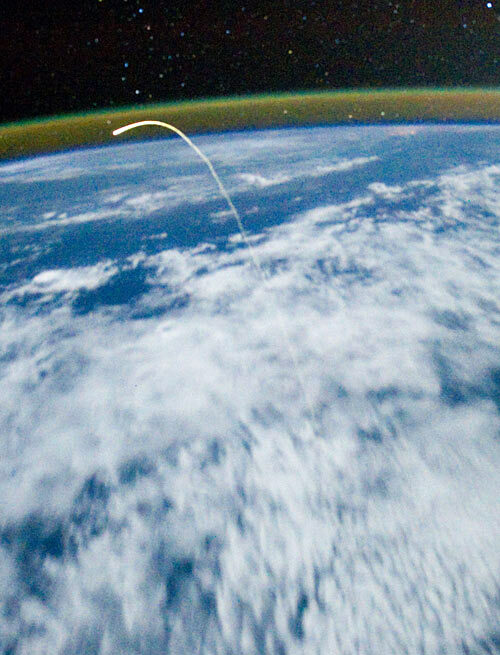 You could say that "re-entry" means any trip from orbital altitude back into the atmosphere, but what most people mean when they use the term is a trip from an actual orbit back into the atmosphere. That's where the big difference lies, because orbital velocity is high. Low-orbital velocity is particularly high, because the closer an orbiting object is to the thing that it's orbiting, the stronger will be the gravitational pull on it, and the higher its orbital speed must be, for it to actually be in orbit and not just fall back down. The earth, orbiting approximately 150 million kilometres from the (very large mass of the) sun, takes a year to go around it once, travelling at about thirty kilometres per second. The moon orbits approximately 385,000 kilometres from the earth; if the earth had the mass of the sun then the moon's orbit would be extremely fast at that relatively small distance - Mercury, orbits the sun at an average distance of about 58 million kilometres, and travels at about 48 kilometres per second. But because the earth is much less massive than the sun, the moon takes 27.3 days to go around us once, travelling at only about one kilometre per second relative to us. The International Space Station's low orbit takes it around the planet in only about ninety minutes; it therefore travels at about 7.7 kilometres per second, more than 22 times the speed of sound at sea level. Re-entry is still a problem even if you're out in a very distant and slow orbit, though, because you can't just teleport from that distant orbit to the edge of the atmosphere. You have to use something - rockets, or some gravity-assist trick around some other body - to reduce your orbital velocity, putting you on a new orbit that intersects the planet's atmosphere, preferably in a survivable way. That orbital adjustment reduces your speed relative to the planet, but then your new elliptical path means you fall toward the planet at greater and greater speed. Five hours before splashdown at the end of the Apollo 11 mission, the spacecraft was about 76,000 kilometres from the earth and approaching the planet at less than three kilometres per second. Five and a half hours later, as the spacecraft started to catch some real atmosphere and lose radio contact, they were still about 3,000 kilometres from their splashdown point (including a large diagonal component, since they weren't plunging straight down toward the planet), and were now moving at eleven kilometres per second. So one way or another, a return to the earth from orbit or from a trip to some other part of the solar system involves very high speeds. Such high speeds, in fact, that friction with the air contributes little to the heating effect; it's air piling up in front of you and trying to get out of your way, and being heated by hypersonic compression, that creates the glowing plasma halo and glowing-hot heat shields on re-entering spacecraft. You can avoid all of this if, like SpaceShipOne and Two and other "sub-orbital" vessels, you never get anywhere near orbital velocity, and just fly up until the sky is black and the earth is curved, then fall back down. When you start to fall there's little air resistance and almost as much gravity as at the surface of the earth (even the International Space Station is close enough to the earth that it's subject to gravity about nine-tenths as strong as at sea level), so you can get up to some moderately impressive speeds by aeroplane standards. But you're a long way from true re-entry speed. For comparison, the fastest aircraft humans have ever managed to make that truly qualifies as an aircraft - takes off and lands under its own power, can be refuelled and re-used, has enough fuel to fly a reasonable distance, carries living humans and usually keeps them that way - is the Lockheed SR-71 spy plane. Most of the SR-71's technology remains impressive today and was nearly miraculous in 1964, but the thing was such a nuisance to operate (and was largely superseded by satellites and drones) that it's now been retired in favour of its 1950s predecessor, the glider-like U-2, maximum speed only impressive by World War II standards. Flat out, with its skin hot enough to melt lead and five kilograms of fuel going into the engines per second, the SR-71 could manage about one kilometre per second. That's nine times the speed of the fastest production car, three times the land speed record, and quite close to the muzzle velocity of the most outrageously fast rifle bullets. But any random piece of dead-satellite or rocket-casing space junk that fireballs its way to destruction in the atmosphere is pretty much certain to beat the SR-71 by a factor of at least ten. Space Shuttle re-entry was carefully controlled to get it under nine kilometres per second before it started really heating up, but you can see why it was such a big deal when Columbia had a hole the size of a saucer in one leading edge. You can avoid all this, too, if you've got a lot more engine power to play with. Come up with a sci-fi drive that can deliver lots of thrust for long periods of time with little vehicle mass (in technical terms, both large thrust and very high specific impulse; the closest we've managed to come to these goals has been strangely unpopular...), and you can leave the atmosphere as slowly as you like, accelerate to orbital velocity as slowly as you like, and generally Superman your way around the solar system without having to endlessly account for every joule and newton lest you end up drifting to Neptune while your air runs out, or turn into an array of orange streaks across the sky. This is where "escape velocity" comes in, too. Escape velocity (more correctly, in physics terms, escape speed, since direction is irrelevant) is how fast you need to be going, from wherever you currently are, to break free of the gravity of a given body. If you're at sea level on an earth with a magic spaceship that is not subject to air resistance, then 11.2 kilometres per second is the speed you need. If you shoot off in any direction (even, theoretically, through the planet, if your magic spaceship is also not subject to ground resistance...) at 11.2 kilometres per second, you're not going to come back down. Escape velocity on the moon (where air resistance really isn't a problem) is only 2.4 kilometres per second, but Alan Shepard's golf balls definitely did come back down. They probably wouldn't have on Phobos or Deimos, though, because those tiny bodies' escape velocities are only 11.3 and 5.6 metres per second, respectively. Escape velocity isn't of much direct relevance to Earth-launched spacecraft, though, because something shot out of an 11.2-kilometre-per-second cannon at sea level will definitely come back down after atmospheric drag eats most of that speed. The great problem of getting things up out of our atmosphere and gravity well when all you have to propel them are poxy chemical rockets is finding a way to strike a balance between having lots of rocket power, and using most of that power just to launch the fuel and engines that you need to launch the fuel and engines that you need to launch... You get the idea. A particularly good simulator of this conundrum also exists! Button batteries: Threat or menace? The incidents are no laughing matter, as a swallowed button cell can generate sufficient current to burn a hole in a child's oesophagus, from the inside, without the child displaying any obvious symptoms. Acid can also injure. Even batteries that appear depleted, inasmuch as they can no longer power electrical devices, can inflict these injuries. Is it just me, or is the claim that a mostly-depleted button cell can "burn a hole in a child's esophagus" via electrical current a complete and obvious impossibility? By leaking strongly acidic or basic electrolyte I can buy, but by electrical action? In brief: Yes, the problem here is burning, and it can be very serious. But it's not electrical burning, it's chemical burning, specifically as a result of electrolysis of tissue fluids. And if a battery makes it to the stomach, the swallower is likely to be OK; it's only if it lodges in the oesophagus that big trouble is likely to result. Well, that's what I learned in the course of writing the following Wall O' Text, anyway. Whenever you find yourself wondering about some oddball medical news, you should proceed directly to PubMed. PubMed lets you search the Medline, and some other, medical research databases. You'll generally only get the abstract of each paper (and not even that, for some), and you're not tremendously likely to be able to find the whole paper for free anywhere (a situation which should change, and actually may). But a quick PubMed search will nonetheless give you a rough idea of the state of research on a subject. But if you're just trying to see whether there's any research on, say, kids swallowing batteries, and you don't need more detail than you get from paper abstracts or letters written to medical journals (PubMed doesn't only index research papers), a couple of minutes on PubMed is all you need. I was surprised to discover that there's actually quite a bit of literature on the subject of kids eating small batteries. I suppose it's the result of more and more consumer items that run from these tiny batteries. In 1980 you might have had a lithium coin or an alkaline LR44 in your calculator or wristwatch, or a silver-oxide cell if you were fancy, or a zinc-air battery in your hearing aid and maybe a mercury battery in your camera. But plenty of people didn't have one button cell in their house. Nowadays, small remote controls, key-ring flashlights, laser pointers and umpteen other glowing tchotchkes run from miniature batteries, and it's easy to get the batteries out of most of these items. The only other thing you need to guarantee many tiny-battery-ingestion events is firm instruction from a parent that children must most emphatically not eat said batteries. However it happens, kids are eating batteries, and the results can be quite serious. ...which isn't as excitable as its relatives further down the leftmost column of the Periodic Table, but which is still not something you want running around loose in your stomach. Lithium salts: Mood stabiliser. Metallic lithium: Mood ruiner. In theory, stomach acid could eat through the casing of a battery, but in practice this doesn't seem to happen. Especially not with lithium cells, which are deliberately made very resistant to corrosion specifically to stop them from starting fires all over the place. The same goes for pretty much every other tiny battery; I don't know which of them have stainless-steel casings, but it seems they can be expected to pass through the gastrointestinal system pretty much intact, even if they do some damage on the way. 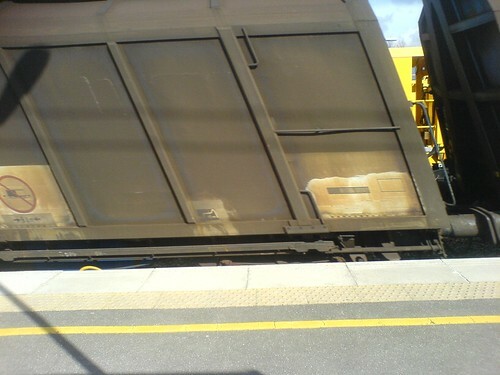 The mechanism for said damage does seem to be electrical, but not directly. Even a brand new button cell doesn't have a lot of power to deliver, and the harder you load a battery the less capacity you'll get, but swallowing a battery will give it a quite nice low-resistance pathway from one terminal to the other, and button cells all have terminals separated by only a millimetre or two. This means something close to the battery's full short-circuit current could flow through a quite small amount of tissue. The relatively large circumference of a coin cell will spread out the affected area a bit, unless the battery lodges in such a way that only part of its circumference has a good contact. ...in which the twenty-amp current range of a multimeter, with about one ohm of resistance including the wires, stood in for the conductive lining of a human gut. I think one ohm is a pretty good figure to go with, here; human tissue is often not very conductive at all (put multimeter probes next to each other on your tongue and you can get a surprisingly high reading; more invasive test techniques are discouraged), but I think the internal mucous membranes, plus stomach acid or one or another salt, are both pretty conductive and pretty easy to damage. My first victim was a tiny LR754 alkaline button cell, 7.9 by 5.4 millimetres in size, which had been sitting in my miscellaneous-battery drawer for a while but still had an open-circuit voltage above 1.5 volts. At the moment when I clicked the magnetic contacts onto the cell it produced more than 0.2 amps, but this fell to 0.1 amps after 30 seconds, 0.07 after a minute, and so on down the line until it was 0.01 amps at five minutes. Next I tried a CR2016 lithium coin cell, 20mm in diameter and 1.6mm thick. These cells are commonly used in Photon-type key-ring flashlights; red key-ring lights can run from one double-thickness CR2032, but blue, green and white LEDs need more voltage and so run from a series stack of two 2016s. The 2016's initial open-circuit voltage was 3.25V, but it managed less than 0.01 amps from the outset. I thought I might have picked a defective or very old CR2016, but who cares, if the ceiling performance of shorted lithium coins isn't high enough to be a worry anyway? So I next tried to establish where that ceiling is by testing a beefy (by coin-cell standards) CR2430 (24mm wide, 3mm thick), which had also been on the shelf for rather a while and only started at 3.16 volts open-circuit, but which still should be able to easily beat any of the more common 2016s or 2032s. The 2430's initial current was up around half an amp, but that lasted less than a second. It managed 0.16 amps after 15 seconds, 0.12 amps after a minute, 0.09 after two minutes, and kept going strongly (again, by coin-cell standards); it still managed 0.08 amps after four minutes, 0.06 after seven minutes, and was still managing 0.03A after thirty minutes, which was when I unshackled the prisoner from the wall and consigned him to eternity in the rubbish bin. OK, so this cell managed to deliver something in the neighbourhood of a tenth of an amp for at least a few consecutive minutes. 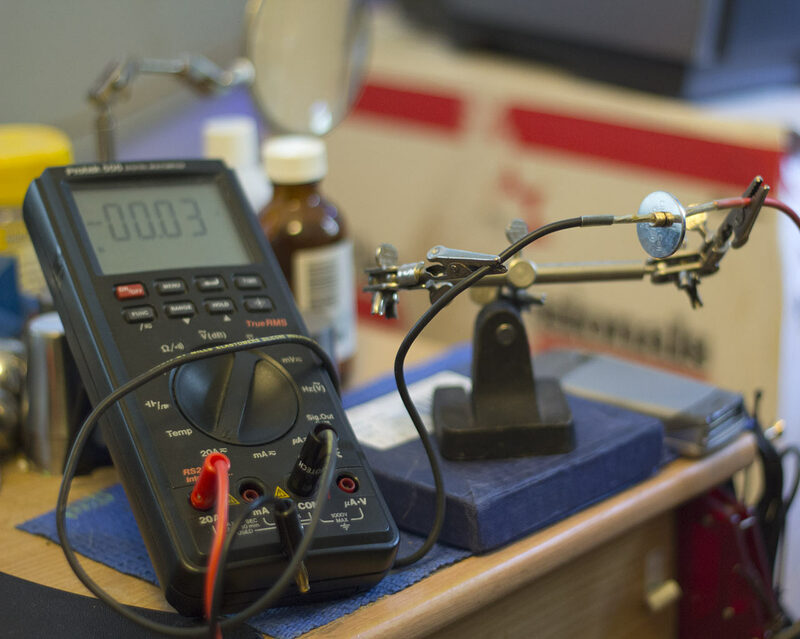 Voltage equals current times resistance, so if the current is 0.1 amps and the resistance is one ohm, there must be only 0.1V across the battery. (Voltage sag is normal in overloaded batteries.) Power equals voltage times current; 0.1 volts times 0.1 amps gives a miserable ten milliwatts of power, which even if it were concentrated in one small spot probably wouldn't, I think, directly singe even a baby's oesophagus. My last victim was an alkaline LR44. I think this is the button battery most likely to end up inside a child, because it's both conveniently pill-shaped and very widely used. The one I chose started out at 1.57 volts open-circuit, and initially managed to deliver more than 0.3 amps into the short circuit. This, again, fell very rapidly, to 0.23 amps at 15 seconds, 0.21 at 30 seconds, 0.18 after a minute, and so on. At five minutes it was 0.12 amps, and just before ten minutes it suddenly fell from 0.07 amps to only 0.01, perhaps because of some internal failure caused by the short. OK, let's suppose we've got a very beefy LR44 that manages to deliver 0.3 amps into one ohm for a significant amount of time. V equals IR, once again, I is 0.3, R is 1, therefore V is 0.3V, and V times I is a pathetic 0.09 watts. Again, this doesn't seem to me to be very dangerous. And the medical literature mostly agrees. If a button battery lodges in the oesophagus then you have a problem. A neck-lodged battery can cause a tracheo-oesophageal fistula (a hole between the trachea and the oesophagus); one did in this unfortunate one-year-old, who recovered, and in this toddler, who didn't. One of the couple of kids who apparently managed to eat an LED throwie escaped without drama. This kid for some reason ate multiple magnets and batteries, but only the magnets then caused trouble. Interestingly, there's a two-page guide to "Management of children who have swallowed button batteries", which was published in 1986 in Archives of Disease in Childhood, in PDF format here. It agrees with the newer papers that it's lodgement in the oesophagus that's the problem, but says thin lithium coin cells don't seem prone to lodge at all. And it also speculates that an increase in pH (an increase in alkalinity around the battery's anode) is what causes tissue burns, not simple electrical heating or leaking chemicals from inside the battery. A swallowed battery is essentially electrolysing water wherever it comes to rest. That'll produce hydrogen bubbles on one terminal and oxygen bubbles on the other, but the salts that make saliva, gastric juices and tissue conductive will electrolyse too. Sodium chloride in water, or hydrochloric acid from the stomach, could give you chlorine bubbles along with the others, which would be bad news. Perhaps it's that, along with mechanical damage from the child trying to swallow the battery or cough it up, that causes fistulas and their life-threatening consequences. Given the feeble numbers I got by short-circuiting miniature batteries, I agree that there really doesn't seem to be any electrical burning going on there. You'd just need more watts per conductive length than 1.5V and 3V miniature batteries can deliver. A twelve-volt A23 battery might do it; A23s have a stack of tiny button cells inside them, and used to be ubiquitous in small radio transmitters like car central-locking key-fobs and wireless doorbells, but are now being replaced by lithium coins. I bet a standard rectangular nine-volt battery could do it too, in the unlikely event that even a full-grown adult, let alone a child, somehow managed to ram one down their throat. There are rechargeable button cells as well, which like other rechargeables have a lot more current capacity than non-rechargeables of the same size, but they're rare enough that no child may ever actually have swallowed one. There are various other individual case reports, ranging from the benign to the fatal, in the face of which one should remember that surely for every kid who ends up in hospital for battery-eating there must be a few who ate and later excreted a battery without any adult noticing. Or, at least, without any adult noticing until they changed that nappy. Saving the best for last, here we have "an analysis of 8648 cases", the full text of which is available for free. The authors conclude, and also say in this slightly later paper (also online for free), that the severity of battery-swallowing injuries is getting worse, because of proliferation of 20mm-plus coin cells, which (in contradiction of the 1986 management guide) now seem to be the most dangerous. Misdiagnosis seems to be a major part of the problem, though, which shouldn't be too hard to fix since batteries show up loud and clear on an X-ray. Oh, and kids do manage to swallow AAA and AA batteries too; more than 5% of the 8648 cases involved "cylindrical cells". These authors also say it's alkalinity - formation of hydroxide ions in tissue fluids next to one terminal of the battery - that "is now appreciated as the most important mechanism" in batteries damaging flesh. So yes, swallowed batteries can "burn" the swallower, but chemically, not via resistive heating, which barely happens at all because these batteries can't deliver much power. In the absence of complications like swallowed magnets, there only seems to be a danger if the battery lodges in the oesophagus. But 20mm and larger lithium coin cells are a good size to do exactly that, and if one does, there appears to be a good chance of very bad results. The authors of those two meta-analyses says there's a 12.6% chance that a child younger than six swallows a 20mm-plus coin cell will "experience serious complications or death", but they base that primarily on the records of the US National Poison Data System and National Battery Ingestion Hotline (who knew? ), which of course don't get to hear about battery-consumption that doesn't cause any problems and passes unnoticed. Still, in the million-item list of things for parents of young children to freak out about, this doesn't seem like a silly one. I think parents could do worse than scan their house for remote controls, kitchen scales, toys and so on that have small and easily-removed batteries. 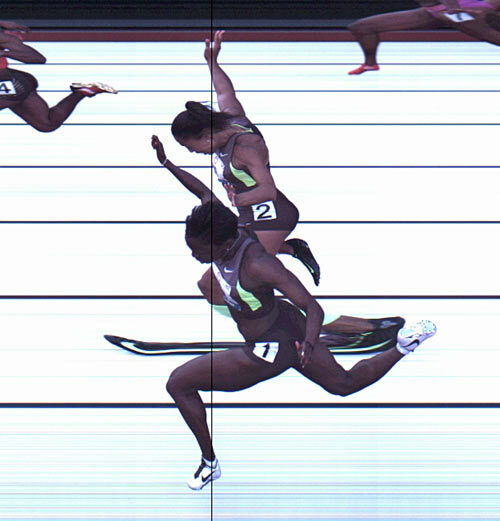 What the hell is going on in this "photo finish" picture? Two sprinters are perfectly tying for third place and creating new track and field rules, but what I mean is what's going on with runner #2's Sideshow Bob foot, and runner #1's Rob Liefeld foot. Runner #7 in the background looks pretty weird, too. According to the New York Times, "the finish line cameras capture up to 3,000 frames per second". Do all of those frames look like this?! The obvious way to implement a finish-line camera is, as the NYT say, to just run a movie camera at a huge number of frames per second. This is not actually how most finish-line cameras work, though, primarily because of how shutters work. A perfect camera shutter uncovers the film or sensor all at once, stays open for however long it's supposed to, then blocks the light, again all at once. You can try to implement something that works like this in electronics, or evade the problem by opening the shutter with the subject in darkness, briefly illuminating the subject with a high-speed flash, and then closing the shutter in darkness again. But that's no use for everyday photography or photo finishes, and making a physical object that works as an ideal shutter is pretty much impossible. Instead, still and video shutters are implemented with "curtains", sliding plates, rotating discs, and various other things, none of which behave much like an ideal shutter when you need very brief exposure times, as is necessary if you need to see which runner, horse or car got over the line a hundredth of a second before the next one. Most all-electronic cameras don't come anywhere near having an ideal shutter, either. Instead, they have a "rolling shutter" that scans across the frame, line by line or column by column, in a short but distinctly non-zero amount of time. Rolling shutters aren't great for video, because things moving across the frame - because they and/or the camera are moving - will be in a different place as each new line or column of the frame is detected. This creates distinctive forms of distortion. OK, so here we have examples of distortion created because the "hole" that lets light into the camera is changing in size, shape and location over a long enough period of time that it visibly interacts with moving objects in the scene being photographed. This is bad for everyday photography, when you don't want things you're shooting to look weird. For this reason, most finish-line cameras aren't super-high-speed movie cameras, but instead a kind of slit camera. A slit camera has a line-shaped lens, which exposes the film or electronic sensor line by line or column by column, not unlike the way a rolling shutter works. The critical difference, though, is that a slit camera can keep on going indefinitely. You can keep collecting image data, or keep spooling film past the slit, for as long as you have memory or film. The shutter never closes as long as the film or memory lasts, so it's impossible to miss any action between the frames. OK, so now imagine taking a flatbed scanner sensor and setting it up vertically, looking across a racetrack at the finish line. Start a "scan", and it'll authoritatively tell you when every body-part of every runner makes it to the finish, by simply showing that part of that person before any part of anyone else. The speed of the scan should be set to roughly match the speed of the runners, so they look generally the right shape, but any part of any runner that stays stationary relative to the scan rate - a foot on the ground, for instance - will seem long. Any part that's moving forward relative to the scan rate - a hand or foot coming forward, for instance - will seem short. Even if you mess up the scan rate so everyone looks wide or narrow, whatever part of whatever runner shows up first in the scan is the first to cross the finish line. So let's look at this picture again. You can see that runner #4 got second place (whoever got first is off to the left somewhere), and #7 in the background is going to get fifth. Runner #2's foot got to the finish first, and because it was then planted on the ground it looks ridiculously elongated. Runner #1's left foot was moving forward as it crossed the line, and so it's shrunk. Unfortunately for #2, the foot doesn't count. To win, your torso has to cross the line first. #2 has the first foot, #1 has the first hand and then knee, #2 has the first head... and then the foremost part of each of their torsos hits the line, so far as can be seen, at exactly the same time. Here's some more about practical and artistic uses of photo-finish cameras; there's a Wikipedia article as well, of course. Slit-scan techniques have often been used to create strange visual effects, like Doctor Who intros and the trippy bit in 2001.